After a good night's sleep, although it was a little bit strange to sleep in a real bed, we arose to total chaos. The routine we had so carefully worked on for the last 6 days was useless. We didn't have our usual pre-race tasks and chores to do. There was no big dining tent - instead we had to make our own breakfast. There was no bum strapping tent, so Craig had to get Bonte to assist. I have photos, but I don't want to chase away the other 4 people that read this blog. At least there was a porcelain toilet! My stomach was still acting up, but Bonte had done a good job with her ginger and mint tea. I was even tempted to put that in my Camelbak for the day. For good measure, I took an imodium and valoid - I was not going to be stopping unnecessarily today. 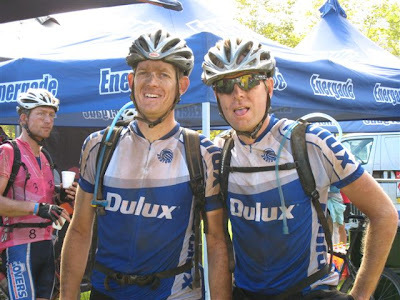 For the first time in 6 days we were going to be doing less than 100kms - 91kms awaited us, with 1985m of climbing. As an added bonus, they had thrown in many kilometers of single track through Lebanon forest. 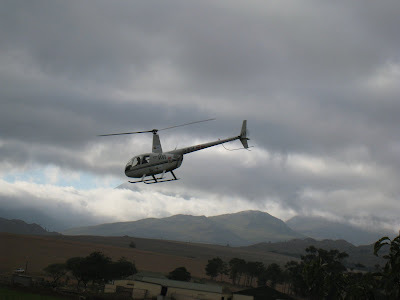 We would spend the night at Oakdale farm in Grabouw. Lining up at the start, I really did not feel up to the day's racing. I even said that I would prefer to go to work than ride my bike. 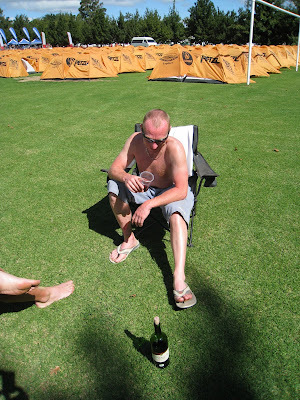 Looking back, I blame all the stomach drugs - what was I thinking. Craig's local fan club was once again out in force, offering final words of encouragement. Every little bit helped. We were starting in C again, but the wide tar section out of Hermanus would give us plenty of room to get around the slower riders. But did our legs have it in them? We didn't have a team plan for today - secretly my plan was to get through the day in one piece, as fast as possible. Up the tarred climb or Rotarty Way I still felt good, and we quickly moved up through the bunch - Craig letting me set the pace. The view was amazing from the top, and while I would have loved to stop and enjoy it, we had other things to do. We safely navigated a tricky section down through Hamilton Russell, before climbing back up on to the Karwyderskraal road and heading towards the Babilonstoring Nature Reserve. Here we were met with lots of sand and some rocky, technical jeep track. 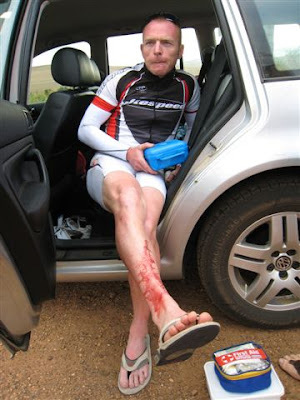 Craig had a tumble, and although he had drawn some blood, seemed ok. Before long, we were back on the farm roads, where Craig took up his position for the day - on the front. We had been caught in no man's land, and were trying to ride across to the group ahead of us. Slowly but surely we were getting there, and just as we bridged the gap, we arrived at the first water point. Craig was eager to push through without stopping, but I needed to tend to my belly. At the other side of the water point the ladies were waiting for us, and were as enthusiastic as usual. We crossed the R44, and were greeted with some very soft sandy conditions. Once again we were off our bike and pushing. I learned later that even the pro's pushed that section. We were now at the base of the big climb of the day. It wasn't a steep climb, just a long climb with a couple of steep sections. We made good progress up the climb - with me walking where it got too steep, but still keeping a good pace going. At the top we were a short way behind a promising looking group, and Craig once again drove us onto the back of the bunch. 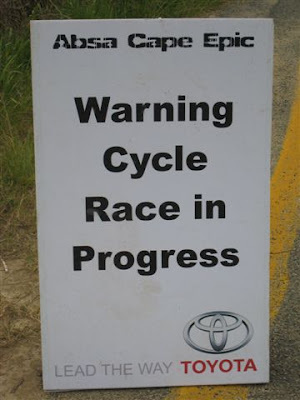 I had to work hard to hang on, and when several of the other riders started to get dropped from the bunch I started to wonder when my turn would arrive. Rather miraculously, and with some hard work we were able to stay with the group until the next water point. Craig was busy playing mind games with me - he was reading off the distance we had done on his computer, and from the readings he was giving me, we were flying. I would come crashing down to earth at each watering point as they told us just how far we had really gone. At the second water point Craig was about 12kms out. That was 12kms he said we had already done, but we still needed to do! As we entered the Lebanon single track, I got a scare and thought I had a puncture. 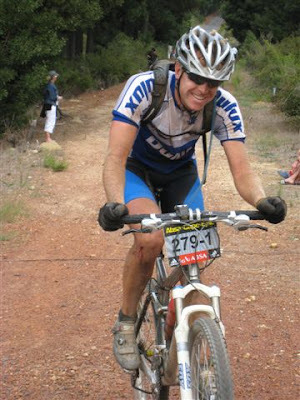 After reassurances from Craig we were on our way again, and making up some good time on the single track. There is nothing that a mountain biker enjoys more than downhill single track. I heard afterwards that several of the pro's went back to Lebanon after the Epic, just to ride the single track again and again. I quickly lost sight of Craig, but still was keeping up a good pace. Before long we popped out of the forest, and once again were greeted with the sight of our wives, and several other familiar faces. We got the loudest cheering by far. 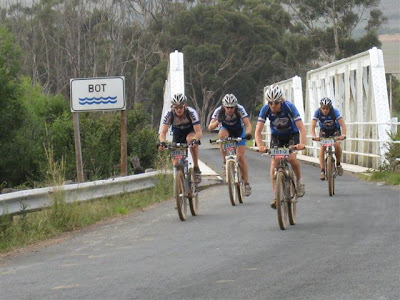 Little did we know that just up ahead of us, one of the teams from Hermanus had just gone through. With the joys of the singletrack now a distant memory, we slowly start climbing our way back up. We dipped under the N2, and for the first time, I was tempted to grab onto Craig's CamelBak. But I didn't. We couldn't have much further to go. Could we? After what seemed an age of teeth gritting up farm roads, we once again turned off into some forested single track. while not as nice as Lebanon, it was still fantastic. Craig disappeared again, and I had to work hard to catch him. 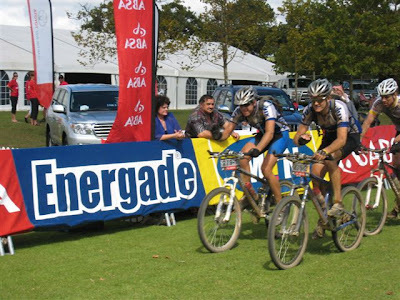 When we finally popped out of the singletrack, we could see two riders up ahead in the distance, one with a very distinctive riding style - the Hermanus riders. The gap took forever to close - they were holding us on the hills, and we were closing in on the flats and downhills. On a particularly steep descent we caught and passed them. 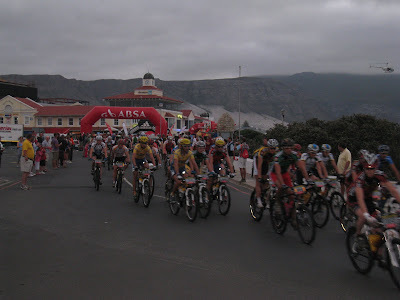 I thought that was the last we would see of them, but as we turned a corner, another uphill awaited us with 5km to go. They passed us on the hill, but a slight wobble gave us a second chance. My second best move of the Epic followed. I knew that if we could get to the top of the hill in front, we would have a good chance to stay away. Using every last bit of strength in my legs, I gave one last effort to get to the top. I think I surprised everyone - myself included. As soon as Craig joined me we made good progress in opening up a gap. Just to be extra sure we weren't going to be passed on the run in to the finish, I managed to position myself such that a media motorbike behind us was unable to get past, and in the process was kicking up lots of dust. Sneaky and devious - I know. 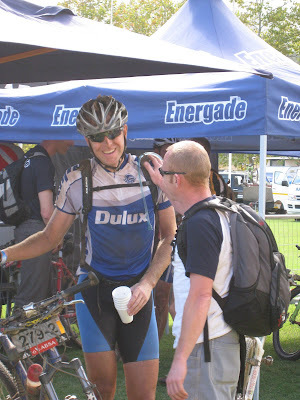 We crossed the line in 45th place, and suddenly, all the pain and suffering of my hardest day so far was worth it. This was the kind of riding we had been expecting to do from day one. 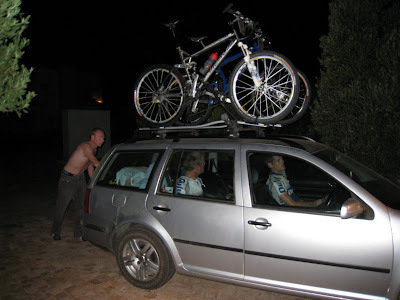 At least we knew we could ride well.The troubles of the first few days seemed a distant memory. 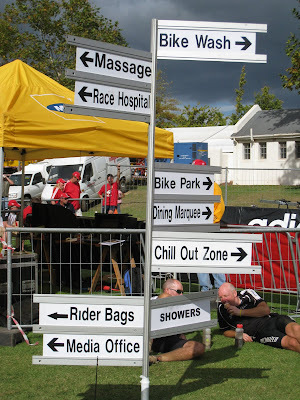 The rest of the day was spent milling around with our wives and other riders - chatting, eating, chilling. We had our last massage, and Karen and Niki didn't disappoint, finding new spots to prod and poke that caused us to squirm and wriggle about on the table. 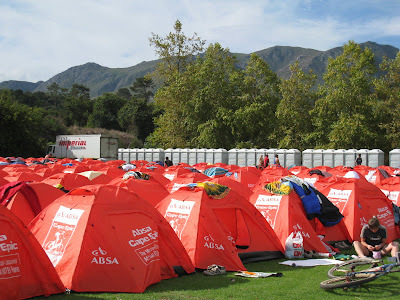 We were 60kms away from home, but for many, the race was over. Tomorrow was just a technicality, or so we thought. Russell sacrificed himself today in an offering so that we wouldn't have any mechanical issues. 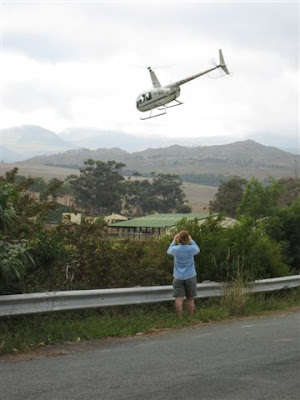 He was hit by a car just outside Hermanus - the driver didn't see him. Thankfully the bike was ok, but he didn't come off so well. Quite a few nasty scrapes and bruises.